Rockin’ countertops–geologic time in our kitchens and bathrooms! 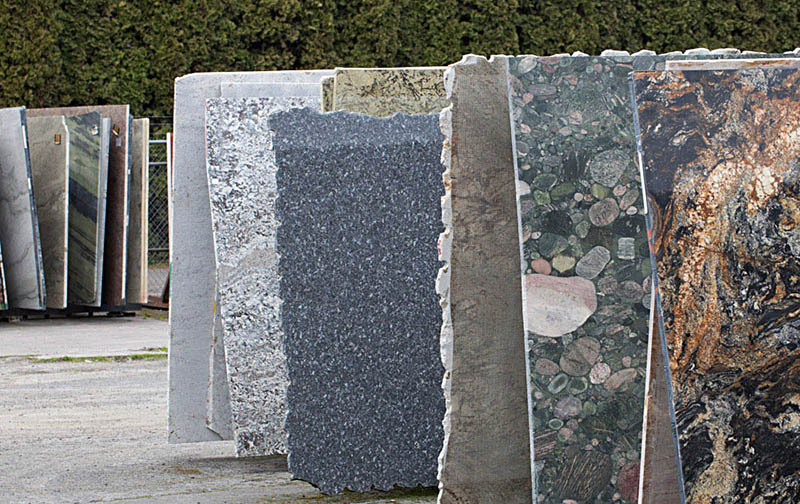 I stopped by a “granite” supplier yesterday –the kind of place that sells “granite” and “marble” slabs for countertops. Besides the fact that almost none of the slabs were actually granite or marble, they were spectacular rocks that showed wonderful wonderful detail. I nearly gushed at the idea of taking a geology field trip there. It’s local, and you seldom find exposures like this anywhere else! slabs of polished rock at a “granite” warehouse –most of it’s not actually granite, but it all reflects geologic time. Generally speaking, “granite” in countertop language means “igneous” or “metamorphic” –crystalline rocks that form miles beneath Earth’s surface and so require great lengths of time to reach the surface where they can be quarried. When I first started this blog, geologic time with respect to igneous and metamorphic rocks were some of the first things I wrote about –it’s such pervasive and important stuff. So the main point is that your friend’s kitchen with “granite” countertops surrounds you with geologic time every time you walk in there! But check out that green polka-dotted rock on the right side of the photo. Full of rounded cobbles –it’s a conglomerate, originating by sedimentary processes on Earth’s surface. Does it indicate great lengths of geologic time? A Young Earth Creationist might say it were a deposit of “the Flood” and end-of-story. Polished conglomerate –individual cobbles are metamorphic rocks. The green color of the background material comes from the mineral chlorite. That’s a penny (on the left) for scale. The conglomerate is made of beautifully rounded cobbles and small boulders that are almost entirely metamorphic in origin. Most of them are gneisses, which form at especially high grades of metamorphism, typical of depths greater than 8 or 10 miles! After a (long) period of uplift and erosion, the rock was exposed to erosion, gradually breaking into fragments, which eventually became these rounded cobbles, and ended up in the bottom of a big stream channel or on a gravel bar somewhere. But that’s not the end of the story, because this deposit of rounded cobbles itself became metamorphosed –so it had to get buried again. We know that because the rock is pervaded by the mineral chlorite, which gives the rock its green color. Chlorite requires metamorphism to form. Granted, the rock isn’t highly metamorphosed –there’s no metamorphic layering and chlorite forms at low metamorphic temperatures– but it’s metamorphic nonetheless, typical of depths of a few miles beneath the surface. And if you look even closer, you can see some of the effects of the reburial pressures: the edges of some of the cobbles poke into some of the other ones. This impingement is a result of the stress concentrations that naturally occur along points of contact. The high stress causes the less soluble rocks to slowly dissolve into the other, more soluble rock. cobbles, impinging into each other. Stars on right photo show locations. I’m already jealous of the person who’s going to buy this slab of rock. It tells a story that begins with 1) metamorphic rock forming deep in the crust, then 2) a long period of uplift and erosion to expose the rocks, then 3) erosion, rounding, and deposition of the metamorphic cobbles, 4) reburial to the somewhat shallow depths of a mile or two–maybe more, 5) more uplift and erosion to expose the meta-sedimentary deposit, 6) Erosion by human beings. And me? Personally, I’d like to make a shower stall or a bathtub out of this rock –can you imagine??? Geology photos for free download. Here’s a view of the San Andreas fault and Pt. Reyes in northern California, looking northward. 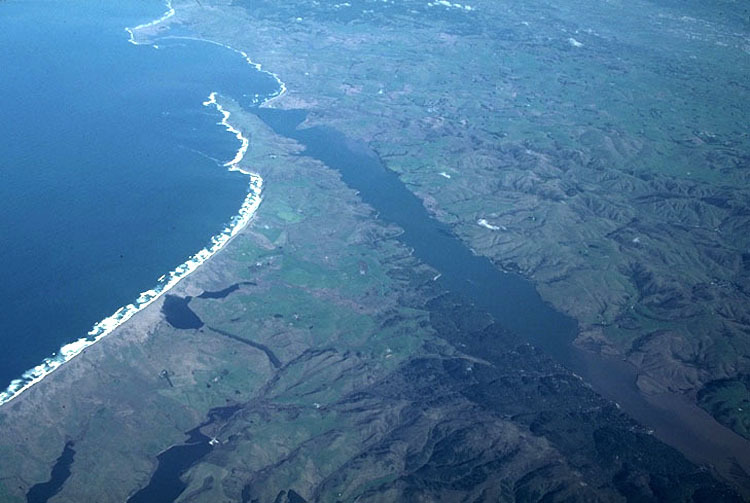 The fault runs right up the narrow Tomales Bay–and in just a few miles, runs along the edge of San Francisco. 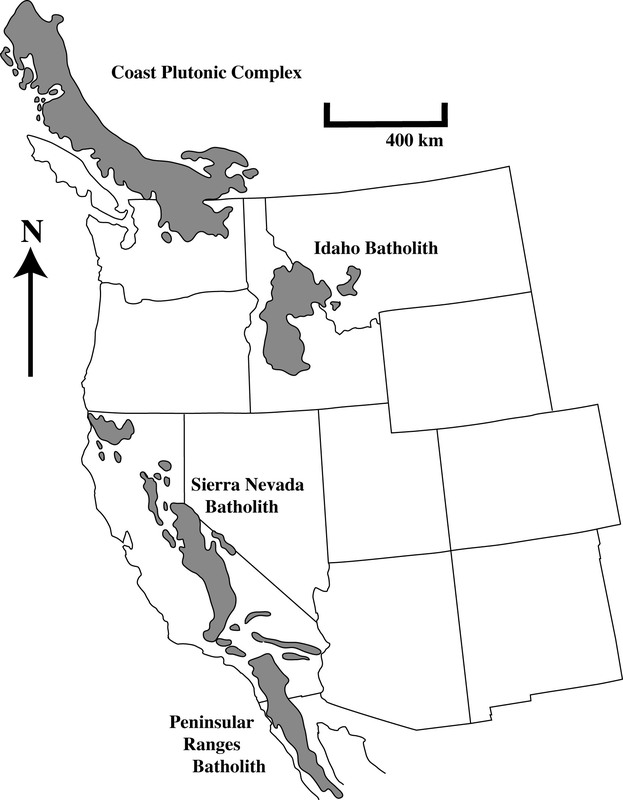 The San Andreas fault is amazingly well-studied –it’s probably the most-studied fault zone in the world. After all, it is capable of generating huge earthquakes in heavily populated areas, so the more we know about it the better. Aerial view of San Andreas fault and Pt. Reyes --just north of San Francisco. View is to the north. The fault runs down Tomales Bay, the narrow arm of the ocean that runs diagonally across the photo. One thing we know about the San Andreas is that it generally moves in a side-by-side way (strike-slip) so that rock on the east side moves south relative to that on the west side. And over time, the fault has moved the eastern rock more than 300km relative to the western rock. Now, 300 km –that speaks to millions of years of geologic time. We can measure the rate at which the Pacific Plate moves relative to the North American Plate –about 4.5 cm/year. The San Andreas takes up most of that –but not all. But if we assume it takes it all, we’re looking at a total of 300km at 4.5cm/year –so at least 6.6 million years. Of course… if you think planet Earth is only 10,000 years old, that means the fault’s moved some 300 meters (3 football fields) every 10 years. And considering that the displacement was about 6 meters during the M 8.3 1906 San Francisco Earthquake…that’s a lot of earthquakes in just a short period of time! Or another way of putting it, if planet Earth were 10,000 years old AND the San Andreas fault formed at the very beginning, 10,000 years ago… then there must have been 50 of those San-Francisco-sized Earthquakes every ten years –or… 5 of those every year. Yikes! But of course… we know that the San Andreas isn’t as old as the planet. It cuts that granite at Pt. Reyes… which is related to the Sierra Nevada granite –which is really pretty young –but older than 10,000 years by about 100 million. 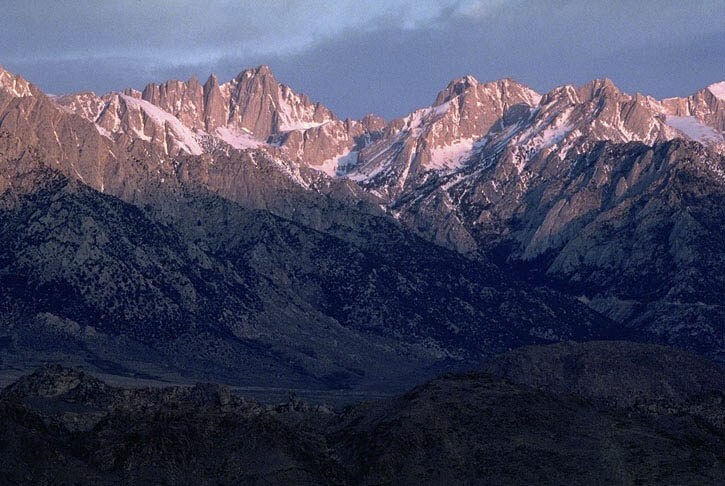 click here if you want to see more photos of the San Andreas fault –with a map! 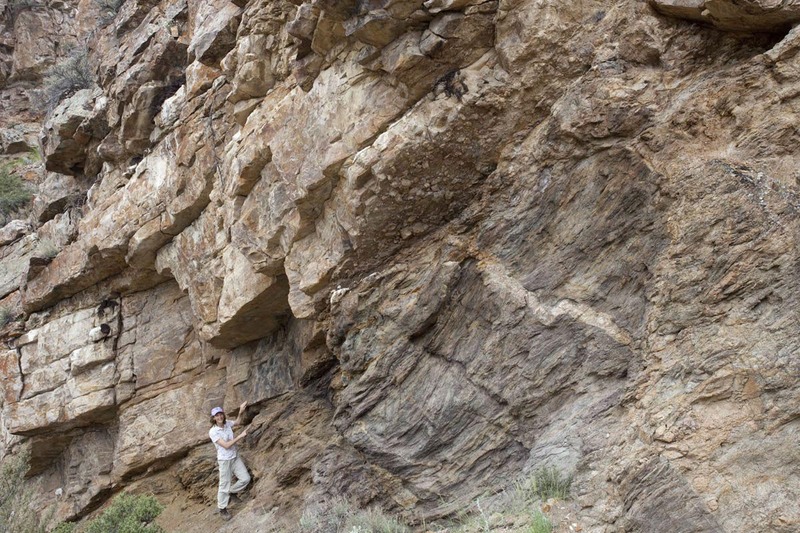 Here’s yet another picture of the Great Unconformity –this time in southwestern Montana. Once again, Cambrian sandstone overlies Precambrian gneiss. You can see a thin intrusive body, called a dike, cutting through the gneiss on the right side. You can also see that the bottom of the sandstone is actually a conglomerate –made of quartzite cobbles derived from some nearby outcrops during the Cambrian. Photo of Cambrian Flathead Sandstone overlying Proterozoic gneiss in SW Montana. And that’s me in the photo. My left hand is on the sandstone –some 520 million years or so old; my right hand is on the gneiss, some 1.7 BILLION years old. There’s more than a billion years of missing rock record between my two hands. 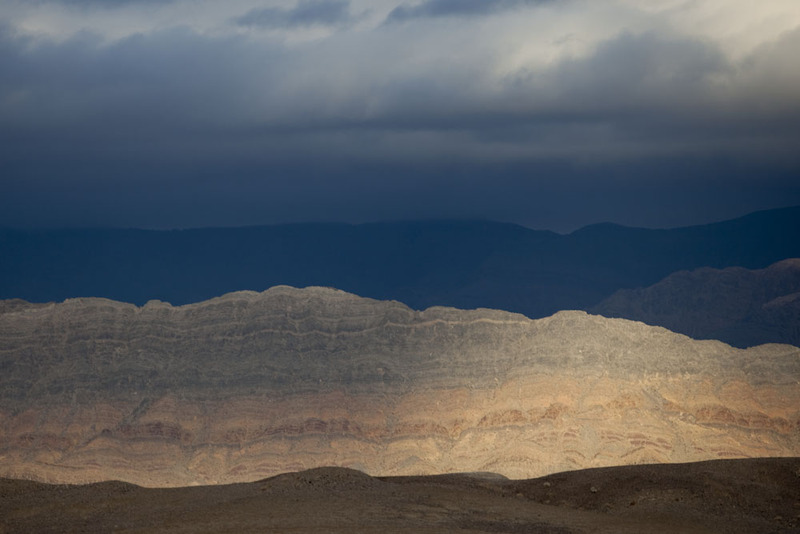 Considering that the entire Paleozoic section from the top of the Inner Gorge in the Grand Canyon to the top of the rim represents about 300 million years and is some 3500′ thick… yikes! And… just like in the Grand Canyon and elsewhere, there is Cambrian age shale and limestone above the sandstone. This rock sequence reflects rising sea levels during the Cambrian. It’s called the “Cambrian Transgression”, when the sea moved up onto the continent, eventually inundating almost everywhere. If you look at the diagram below, you can see how this sequence formed. 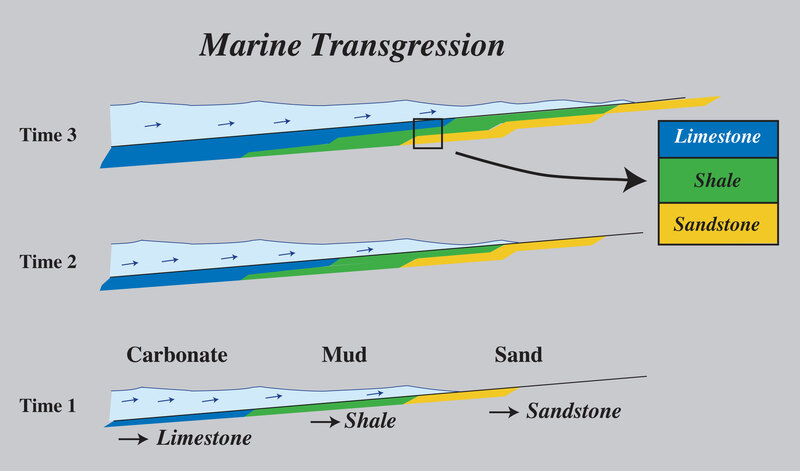 Sequence of rock types expected during a transgression of the sea onto a continent. If you look at time 1, you can see a coastline in cross-section, with sand being deposited closest to shore, mud a little farther out, and eventually carbonate material even farther out. As sea levels rise (time 2), the sites of deposition for these materials migrates landward, putting mud deposition on top the earlier sand deposition and so on. 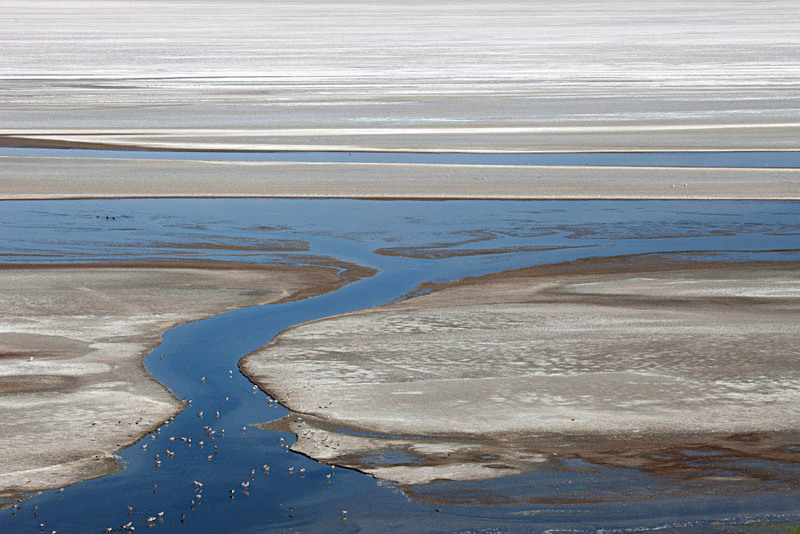 At time 3, the sequence moves even farther landward, resulting in carbonate over mud over sand. If these materials become preserved and turned into rock, they form the sequence sandstone overlain by shale overlain by limestone –just what we see on top the Great Unconformity. So just like intrusive igneous rocks, metamorphic rocks require great lengths of time to accomplish the uplift and erosion in order to be exposed at Earth’s surface. So what do we make of this photograph? It shows a sequence of sandstone, shale, and limestone sitting on top metamorphic rock (called the “Vishnu Schist”) in the Grand Canyon. The sandstone was deposited right on top the schist. 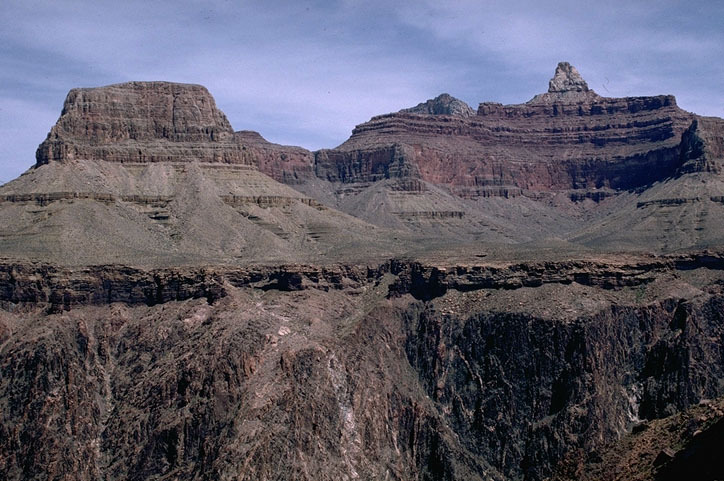 Sequence of Cambrian sandstone (the ledge across the middle of the photo), shale (the overlying slopes) and limestone (the upper cliffs) deposited on top the Vishnu Schist in the Grand Canyon. Since sedimentary rocks, like sandstone, shale, or limestone, are deposited at Earth’s surface –and metamorphic rock forms beneath the surface, this photo shows that BEFORE the sedimentary rocks were deposited, the metamorphic rock (schist) had to have been uplifted and exposed. So all the time required to bring the schist to the surface had to take place before the sandstone was even deposited. The surface of contact between the sandstone and the schist is called an unconformity because it is here that we see evidence for a great deal of missing rock record. The sandstone must be much younger than the schist –for the very reason that the schist first had to get uplifted and exposed at the surface before the sandstone was deposited on top of it. So… because the sandstone is so much younger, but it was deposited right on top the schist, there must be a gap in the rock record between them … an unconformity. And here is where we see evidence for even LONGER periods of time. Overlying the sandstone? Thousands and thousands of feet of more sedimentary rock. And much of that sedimentary rock was marine… formed at sea level. It is now over a mile above sea level. And the schist itself? The people who’ve studied it have determined that much of it was originally volcanic –which means that it originally formed at the Earth’s surface. So… over geologic time, it must have been buried to the depths needed to turn it into a metamorphic rock BEFORE it was uplifted and exposed. So… how old is Earth? Some say 6 or 10,000 years… I think we’re looking at 10s of millions in this photo. And if we consider the numerical ages for these rocks, 1.7 billion is the age of metamorphism of the schist –its original volcanic rock must have been older! Metamorphic rock, just its very existence at Earth’s surface, signifies great lengths of geologic time –on the order of millions of years. 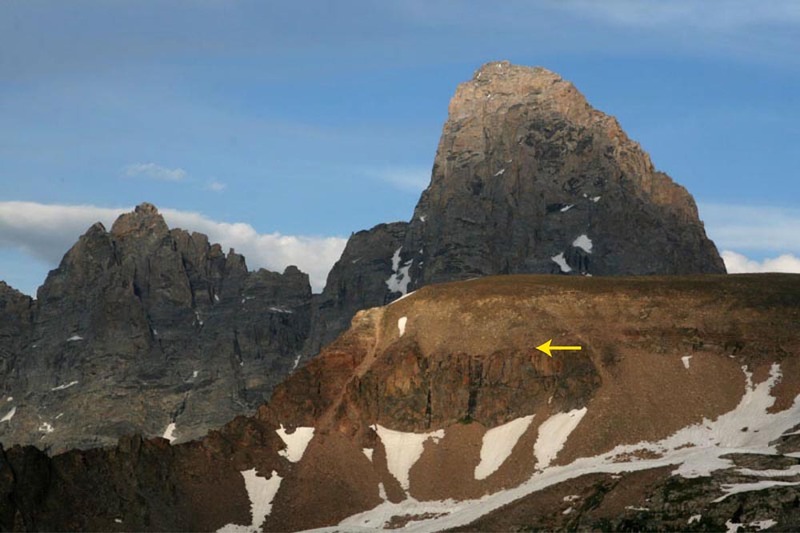 Consider this rock, high in the Teton Range of Wyoming. 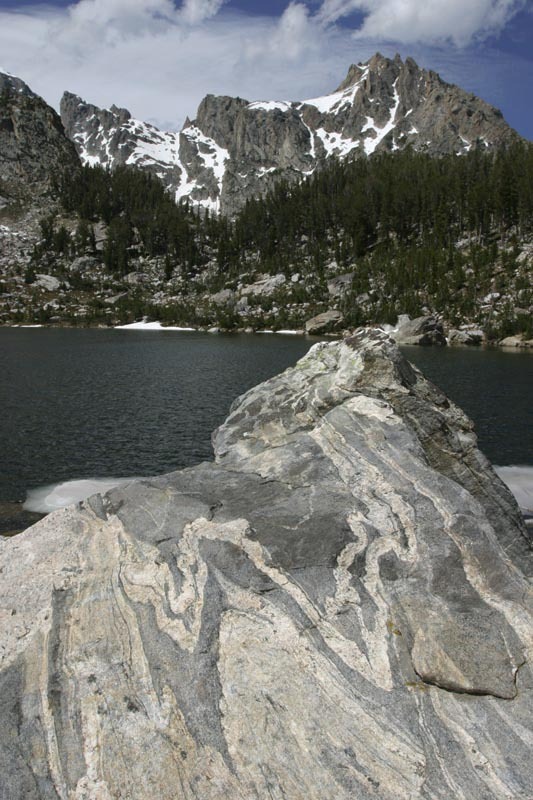 Folded gneiss, formed at depths of 10 km or more, high in the Teton Range of Wyoming. 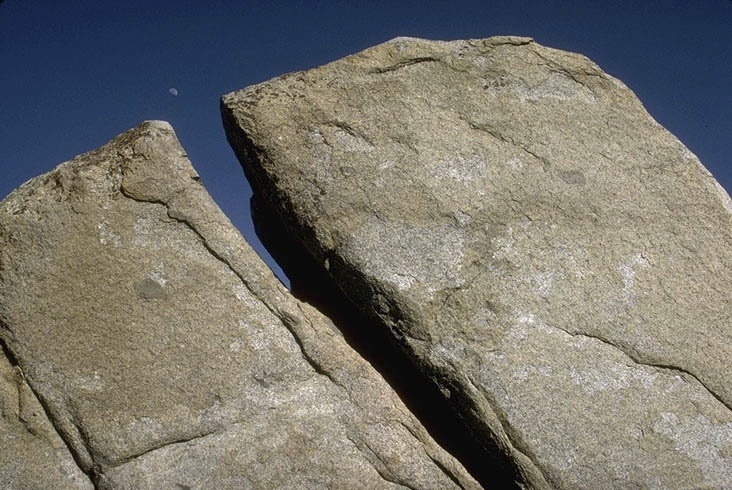 This is a metamorphic rock called gneiss –in a lot of ways, it’s like granite, because it contains a lot of the same minerals –but gneiss forms because an older rock (in this case, probably a granite) was heated to high enough temperatures that its minerals recrystallized into new minerals. And most metamorphism also involves high pressures, so all the new crystals form in a particular arrangement (as opposed to granite, in which the crystals are randomly arranged) –that’s how the layering (called “foliation”) forms in metamorphic rocks: the recyrstallization of new minerals under pressure. 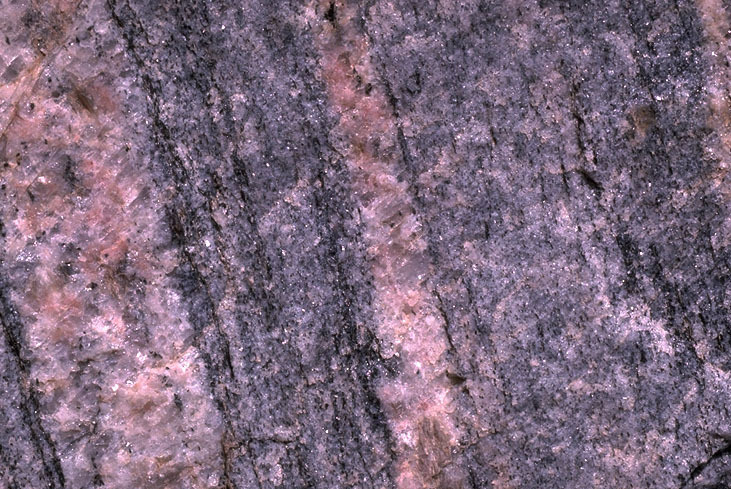 Close-up view of gneiss, showing crystals that formed in the same orientation, as a result of recrystallization while under directed pressure. The layering is called "foliation"
But the key thing here, is that metamorphic rocks form WITHIN the Earth, at depth –and just like granite, require uplift and erosion to get to the surface. This gneiss formed at depths of 10 km or more and was then uplifted to its present elevation, nearly 4 km above sea level. –which requires time. click here to see a geologic map of Grand Teton National Park, Wyoming. 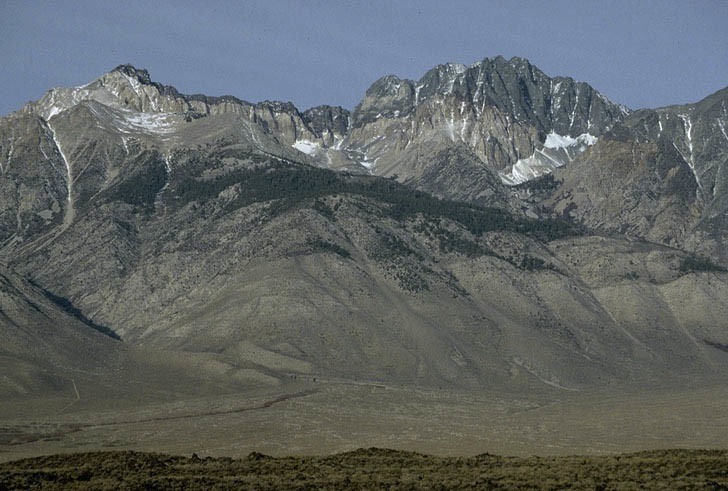 –the last posting, (March 21) had a photo of granite of the Cretaceous Sierra Nevada Batholith intruding Cambrian sedimentary (now metamorphosed) rocks. These photos show more Cambrian rock. The Cambrian Period (542-488 million years ago) is the bottom of the Phanerozoic Eon –and one reason Cambrian rocks are significant, is that they are the oldest rocks to contain shelly fossils. Older rocks, called “Precambrian” may contain fossil impressions or fossilized algae, but don’t contain any shells. 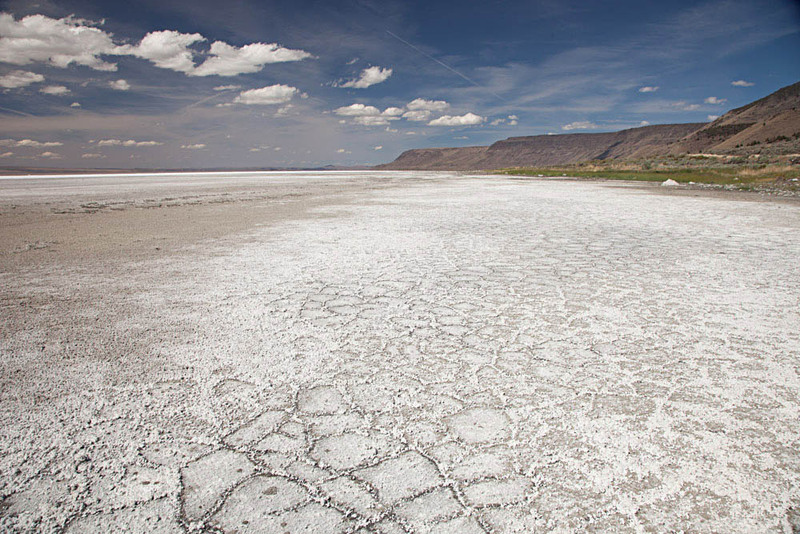 At the risk of being too repetitive (see post March 13) the upper photo shows Cambrian limestone in the Death Valley region –there are thousands of feet of Cambrian Limestone in the Death Valley region. The lower photo shows Cambrian sandstone, shale, and limestone overlying tilted Precambrian sedimentary rock in the Grand Canyon. My point is that the Cambrian section is traceable over great distances. That’s important, because the base of the Cambrian provides a common datum over much of the western US –certainly from the Sierra Nevada to Death Valley to the Grand Canyon –but in later posts, you can see that it’s also in Colorado, Wyoming, Montana… and so on! The photo above shows the Cambrian Bonanza King Formation (gray) on top the Cambrian Carrara Fm (orange). 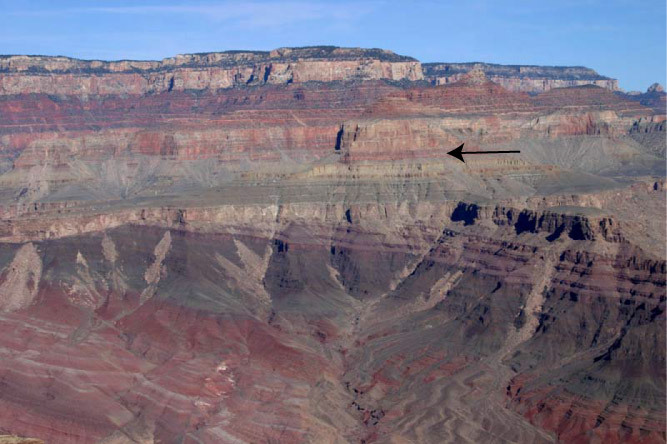 And the photo below shows the near-horizontal Cambrian and younger rocks of the Grand Canyon over tilted Precambrian sedimentary rock. It’s really thin here… the Cambrian only goes up through the arrow.